You don’t have to be Michel Roux Jr to own a good quality knife set. Whether you’re moving house, redecorating your kitchen or you’re simply tired of battling with every single ingredient you prepare, a new knife block will make mealtimes a breeze, and also contribute to the stylistic qualities of your kitchen. Scroll through our buying guide to find the best kitchen knives for quality preparation. Most domestic kitchen knife blocks will contain the essential: an all purpose cook’s knife for general chopping and slicing; a bread knife for making slicing through loaves less laborious; a small serrated knife for carving through veg skin, rind and peel; a carving knife for prepping the main event of your Sunday dinner; and possibly a Santoku knife, which has a blunt end for fine chopping and dicing. But the knives are only one aspect of the product. Knife blocks come in all shapes and sizes, with traditional wooden blocks, ergonomic yet stylish blocks and transparent blocks all owning a place in the market. A good set of quality kitchen knives is a hefty investment, and while you may ask why a basic unbranded set from a high street retailer hasn’t been included in our list, we can safely say that you won’t receive the same longevity or usability factor. Typically, knives are forged from stainless steel, which is a strong, durable metal. People that cook regularly will tell you that they require sharpening fairly often, depending on the amount of use they receive. If your experience with stainless steel has you wondering about harder materials, Japanese Damascus steel is of a superior composition, thanks to its carbon steel core and stainless steel exterior, and requires sharpening less frequently. Robert Welch is a trusted brand within the world of fine cuisine, so buying this set of stainless steel kitchen knives is more of an investment than a generic purchase. Featuring a black handle embellished with the Robert Welch signature, these knives are elegant as they are ergonomic and have been carefully chosen from the Signature range to ensure cooks have the necessary tools for dicing and chopping to filleting fish. 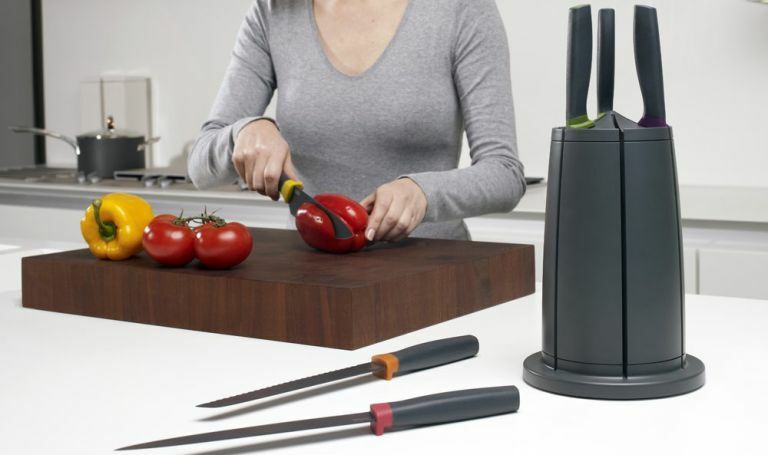 A bonus is the knife sharpener, however users say that there are better ones out there if you’re willing to buy one separately. This knife set offers great value for money, as its RRP is less than our first pick, yet users can’t seem to find anything negative to say about the blades, which makes us believe it’s worthwhile considering. They are similar in appearance to the Robert Welch knives, with the Mercer branding embellished on the handle. The difference seems to be in the flat blade, which some chefs may prefer, and the lack of a sharpener. With the choice between a stainless steel or wood finish block, this is certainly one for modern, traditional and professional kitchens - a great all-rounder. The old saying ‘you get what you pay for’ couldn’t be truer when it comes to knife sets. While you may only really appreciate the difference if you work in a professional kitchen, the fact that these knives rarely need sharpening is a homage to the amount of skill that has gone into their construction. Damascus knife sets are preferred for their strength and durability and are designed to withstand the tribulations of peak service in a professional kitchen. With its magnetic oak support and green tinted glass, the block, too, is refined in its design, making the extortionate pricing justifiable. Even for domestic kitchens, a quality knife set is still fairly expensive. This stainless steel knife set from reputable brand Joseph Joseph will provide you with all the utensils you need to work your way through your favourite recipe book. The slits that run down the side of the block enable you to easily reach and extract your required knife, while the handy colour coding means you’ll always pull out the right one. With a non-stick coating, you should be able to chop with ease, making home cooking less or a chore and more of a pleasure. Any product with a chef’s name tagged along with it should be of superior quality, and this Jamie Oliver Japanese steel knife set shouldn’t let anyone down. Because of the construction of the steel blades, sharpening shouldn’t need to be so frequent, and thanks to the embellished labelling on the tip of the knife, knowing which one is which when you come to use the set shouldn’t be a problem. The beech wood block is traditional in appearance, and should complement most domestic kitchens. They’re not particularly pricey, too.